How Tall Do Lilies Grow? A lily is a term for any plant belonging to the genus Lilium, a wide and diverse group of herbaceous, flowering plants. Chiefly grown for decorative purposes, lilies make a beautiful addition to your garden and are a far less labor-intensive plant than other decorative varieties. Knowing the average growth height of common lily plants is an important part of planning the garden's physical layout. Lilies are a beautiful addition to any garden. Lilies grow from bulbs. When the plants mature and bloom, their large flowers attract attention with their vibrant colors. Versatile, hardy and easy to grow, lilies can be the perfect addition to any home garden. 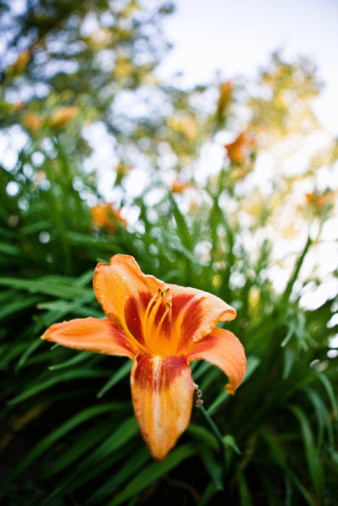 Their appearance and bright colors earn lilies nicknames like "queen" and "grand dame." Some plants, with the word "lily" in the name -- daylily, calla lily, toad lily, surprise lily -- are not actually members of Lilium genus. Actual members of the genus are usually labeled "true lilies." As noted, Lilium is a diverse category of plants, so characteristics vary between different species. Asiatic lilies, such as Alpenglow, Apollo and Connecticut King, generally grow to 2 to 4 feet tall, while Oriental lilies, such as Black Beauty, Casa Blanca and Journey's End, generally grow between 4 and 6 feet tall. Less common trumpet lilies grow to about the same height as Oriental. Black Beauties are probably the tallest of common lily varieties, being the only species reaching 6 feet. Growth characteristics vary widely among different species of lily. Most lilies bloom in the summer. Lilies are usually bought from garden-supply stores and nurseries in bulb form and are planted from mid-September through mid-October in a well-drained soil. Most lilies thrive under direct sunlight exposure; partial sunlight exposure can result in diminished growth. Under these conditions, lilies will bloom fully in the spring. Mulch your lilies when you first plant them for optimal growth and health. An annual spring fertilizing of a phosphorous-rich 5-10-10 fertilizer benefits the lily plants. The watering schedule depends somewhat on what lily species you are growing. 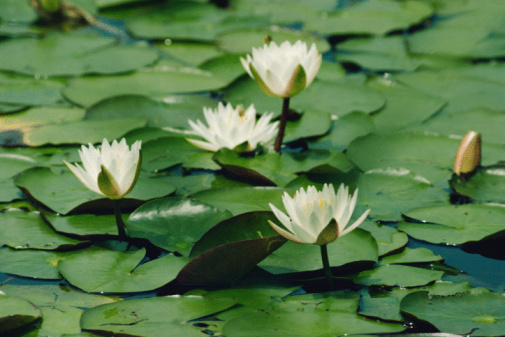 Always water the lilies during the day so that the sunlight can dry moisture on plant leaves, as overly moist foliage leaves the plant susceptible to fungal infection and disease. If you must water at night, water at the base of the plant, never from the top of the foliage. How Long Does It Take for a Daisy to Grow?